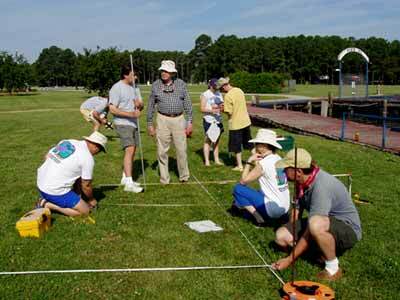 Over the course of three years, beginning in 2002, MAHS conducted research on a wreck in the St. Mary’s River near Cherryfield Point, Maryland. The wreck, which may be a 19th-century wooden barge or ram schooner, also provided a perfect environment for training avocational divers who had completed the MAHS classroom and pool sessions in underwater archaeology. Very little is known about this wreck, therefore the research and field schools presented an opportunity to make a contribution to the body of knowledge on Chesapeake Bay history. Since each field school was designed to continue the work begun in the previous years, the students were briefed not only on the immediate goals for their class but also where that information fit in the overall data collection scheme. Knowing their work was important added to the students' enthusiasm and prompted a sense of responsibility to gather accurate data.